I've been known to fetishize my privacy. I can't deny it. I visibly flinch when the checker at Safeway says, "Did you find everything you need, Mrs. Marshall?" instead of "Can I help you with those bags, Mrs. Glenn?" (For those of you who don't know, at Safeway, I'm Mrs. John Glenn, the proud, straight-spined, Tang-buying astronaut's wife.) They know because I've purchased Mrs. Glenn's groceries with Ms. Marshall's credit card. Damn those giant Medjool dates! Food is such an expensive vice. And now Safeway knows exactly what I buy and they'll swap the data with Netflix so they can correlate it with the movies I rent. Jonathan Zittrain has just delivered some bad news about my privacy in his JCDL 2006 keynote about redaction, restriction, and removal. I think he has anyway. I'd say the gist of it is, "Get over it, Cathy. See all those kids walking around with the iPod ear-buds in their ears? They have. You can do it too." Jonathan's a Harvard-trained lawyer and it's easy to listen to him make an argument -- to be amused, to be swayed, to be totally CONVINCED, but not be completely sure of what you just bought. What I feel sure of is this: My privacy -- I may as well forget about it. I've apparently swapped it for my identity. In creating an online presence -- in publishing our whereabouts, in listing what we read, in documenting what we eat, in cataloging who's seeing whom -- we're back to living in a small town. And despite all my protestations about how we're not paying enough attention to digital archiving, someone is. You might be surprised by how few of those Usenet news postings have gone away. Jonathan did suggest that one should have the ability to declare reputation bankruptcy. You know what he means: one too many pictures has been posted of you singing karaoke and dancing like a spastic. Or your students have taken too many liberties using your image in a creative re-enactment of your battle with Mr. Valenti. Maybe you've even written one too many blog posting that maligns 'tards or made one too many links to pictures of little pink caffeine pills. Or maybe you've even gotten some rotten tomatoes tossed at you in RateMyProfessors.com. Or been caught canoodling with Hugh Grant on Gawker Stalker. You'd like to start over again. With a clean slate. Or a clean Slate. Jonathan Zittrain himself wouldn't have to do this, of course. It's very clear he's one to watch. His own reputation looks to be on a sharply upward trajectory. An eBay red shooting star, so to speak. He may even be able to sell or swap his reputation on eBay; it's safe to say I couldn't afford to snipe on a reputation like that. I wish I could remember the line that connected all these dots. As Pee-Wee Herman would have it: "Connect the dots. 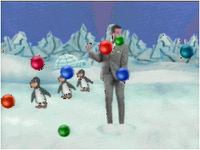 La-la-la-la. Connect the dots. La-la-la-la." 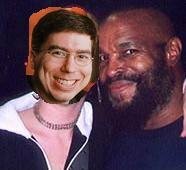 And all I can think of is how Casey Kasem was on the KHJ Boss Radio line-up after the Real Don Steele. Or was that Robert W. Morgan? That's surely not part of the argument, is it? Why did KHJ have a Boss 30 and KRLA a Top 40? It was quite a good talk though, despite even the most attentive audience members' seeming inability to remember exactly how the hypotheticals unfolded. We all seem to have resonated with different ideas, different hypotheticals, and different images. I'm afraid I got distracted at some point during one of the Wikipedia examples, thinking about the propagation of bad information, and how correction doesn't reach out and correct what's already propagated. In other words, the average IQ of Pittstown is going to stay at 68, even if a Pittstown booster goes in there and fixes it up. But then again, if we'd listened to Ted, and done links as transclusion, we wouldn't be in this fix. So -- as I said -- I let my mind and browser wander, although I'm not certain my attentiveness would've guaranteed an ability to reconstruct Jonathan Zittrain's mobius strip of an argument. Damn! 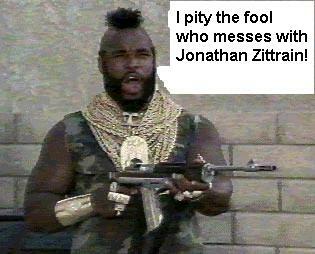 I pity the fool who messes with Jonathan Zittrain! Damn! A side point: Pronouncing the acronym GUI as "gooey" and talking about mash-ups starts getting pretty silly. That's gooey mash-ups. Then you add a couple of protocols and you've got soapy gooey mash-ups. Which can be cleaned up with AJAX. This is why I've drifted away from CS. I can't talk about these things with a straight face. I'm the slowest blogger around. That's because I get transcluded in the gooey mash-ups.